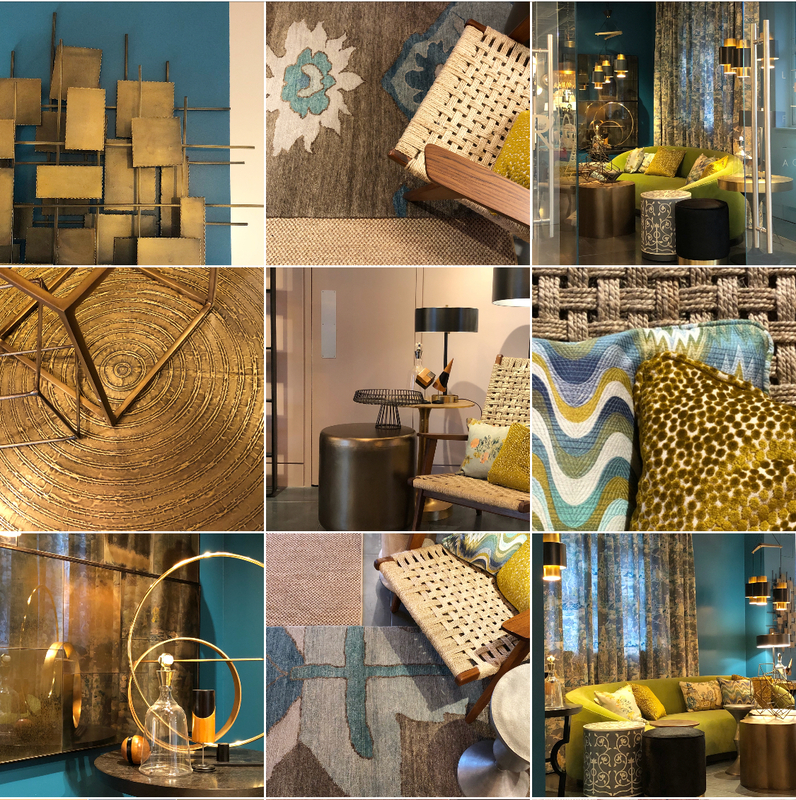 My edit of a selection of pieces from the Arteriors Home collection. Wall behind painted in ‘Marine Blue’ from The Little Greene Paint Company. And this is precisely what drew me to working with the brand: the mix of raw and refined combined with the clear influence of art, fashion and travel with a healthy dose of artisanal luxe to all the pieces. 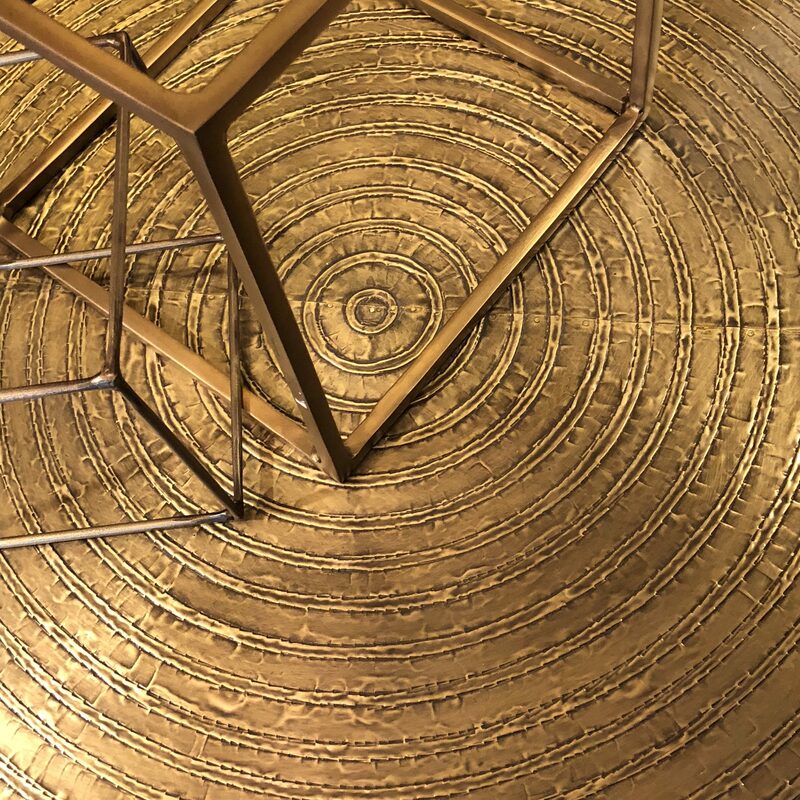 As Mark puts it, “The human element in Arteriors’ products is something I value — it’s the signature that the artist puts on each of the products they produce. 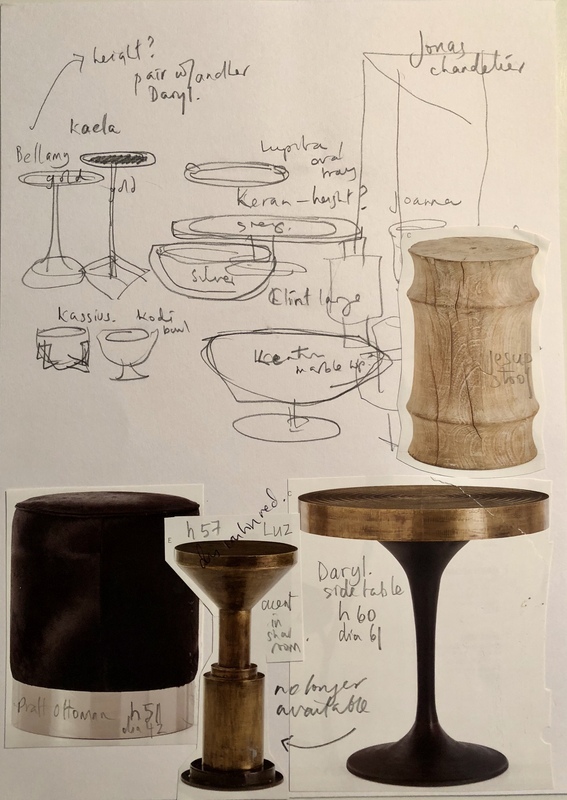 That human touch and artisanal element is what makes each piece special and one-of-a-kind.” It was a marvellous palette to play with, and a great team to collaborate with. I heartily, and authentically endorse its wares! PS It also has a practice in the US (not common in the UK) of selling key upholstery items with a simple muslin covering so you can send them to be dressed in any fabric of your choosing by your own upholsterer (see example here). Genius. In the UK you can follow the usual COM (‘Customer’s Own Material’) protocol and they’ll do it for you in 6-8 weeks with the prices shown including the upholstering costs! Good to know, non. What’s the inspiration behind your curated space? I felt that many of the pieces were incredibly sculptural, as well as rich in form and texture, which made me think of Brancusi, especially his Parisian studio, which is still open to the public, and shows many of his works stacked one on top of the other. 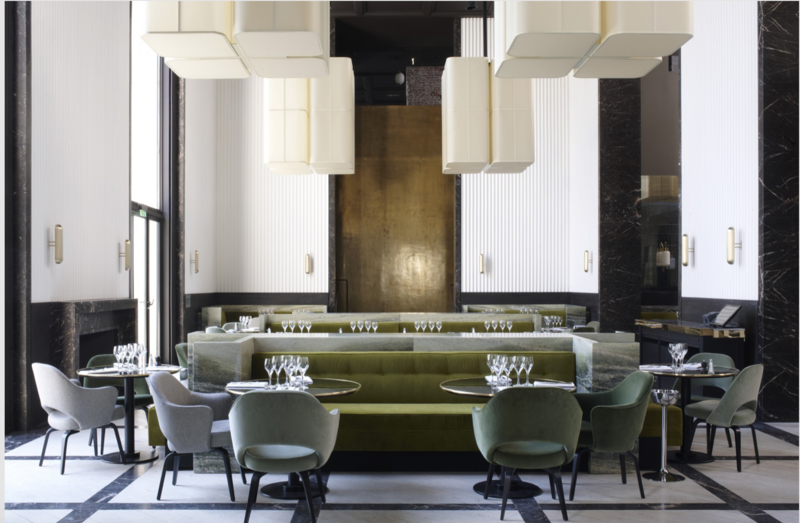 Arteriors’ designs are also made from an extremely refined palette of materials — marble, wood, antiqued bronze, brass, polished nickel and iron — so this made me think too of the French architect/interior designer Joseph Dirand, whose work I really admire. I effectively combined these two references in my head, threw in my love of off-beat symmetry, a preference for multiples (it’s a Feng Shui thing, I believe pairs of pieces make for a happier space! ), and then overlaid that with plenty of rich pattern and texture. 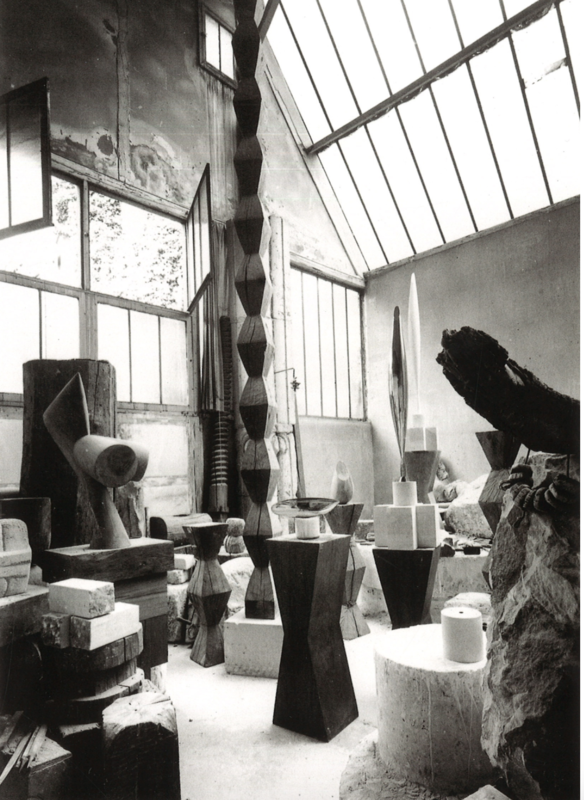 The Parisian atelier of the sculptor Brancusi. Essentially, I worked up from the floor and furniture to create a solid base for the look, centering my concept around the generous curves of the ‘Turner’ sofa (which I re-upholstered in a sumptuous ‘Adamo & Eva’ 100% cotton velvet from Dedar), and then I took a lead from the fabulous ‘Jericho’ reclining chairs (which definitely have ‘Future Classic’ written all over them!) 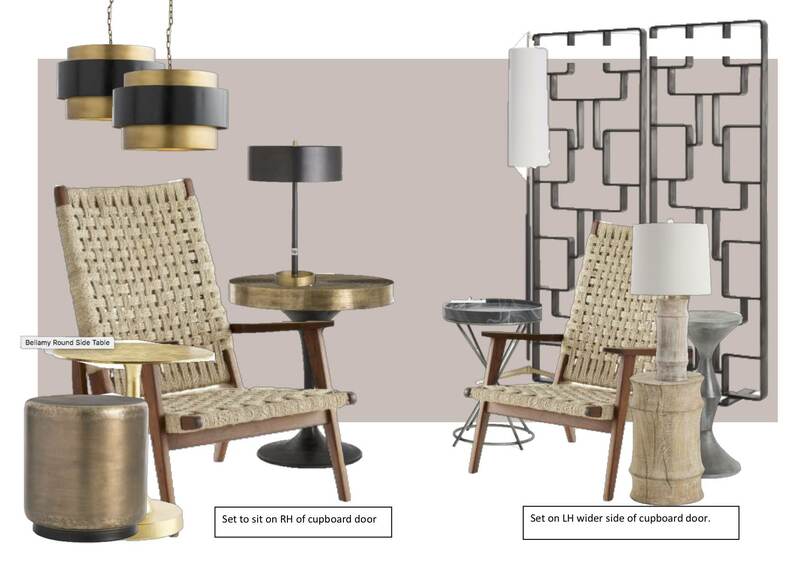 which are finished in teak with hand-woven jute seats and really epitomise the move I predicted on one of my Trendbulletins towards more humble materials being handled exquisitely in the home. I see this sort of project as dressing a space in a series of layers. The final touch? 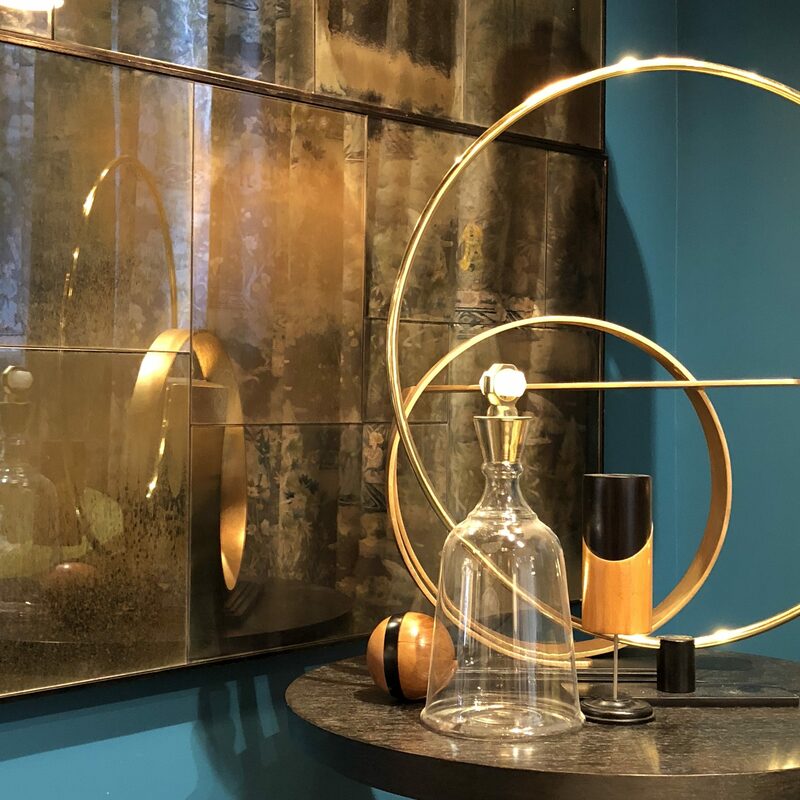 I added jewellery to the look in the form of some of the amazing lighting and accessories which Arteriors really excels at. 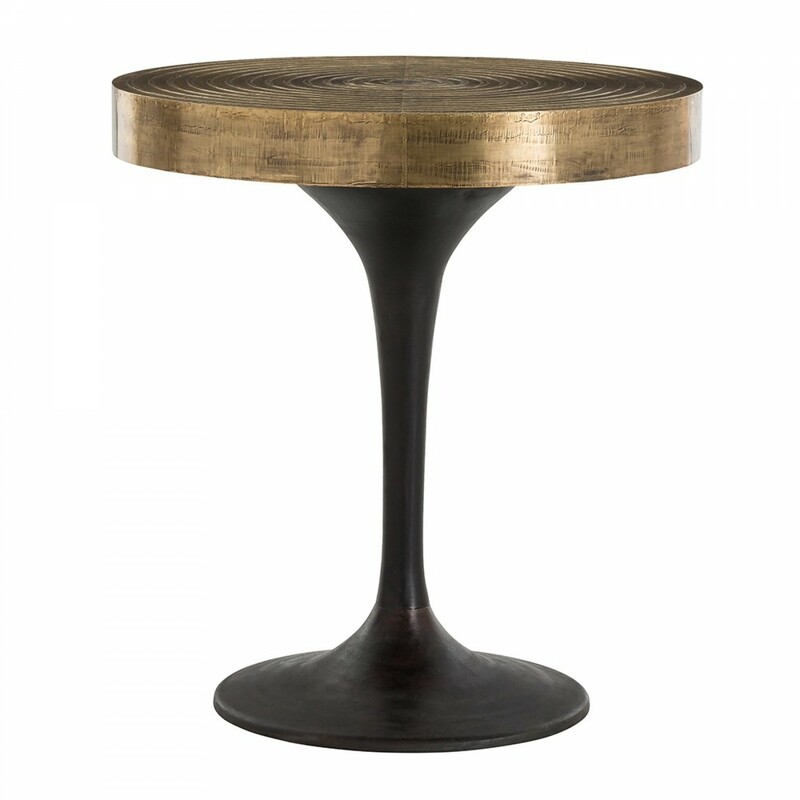 The top of the antique brass covered ‘Daryl’ table. Shown with the ‘McCoy’ three-part brass sculpture. Computer aided cut and paste mock ups for my installation. Olde School! How does the space reflect your personal style? The colours, mix of materials and touch-tastic textures are all very me. 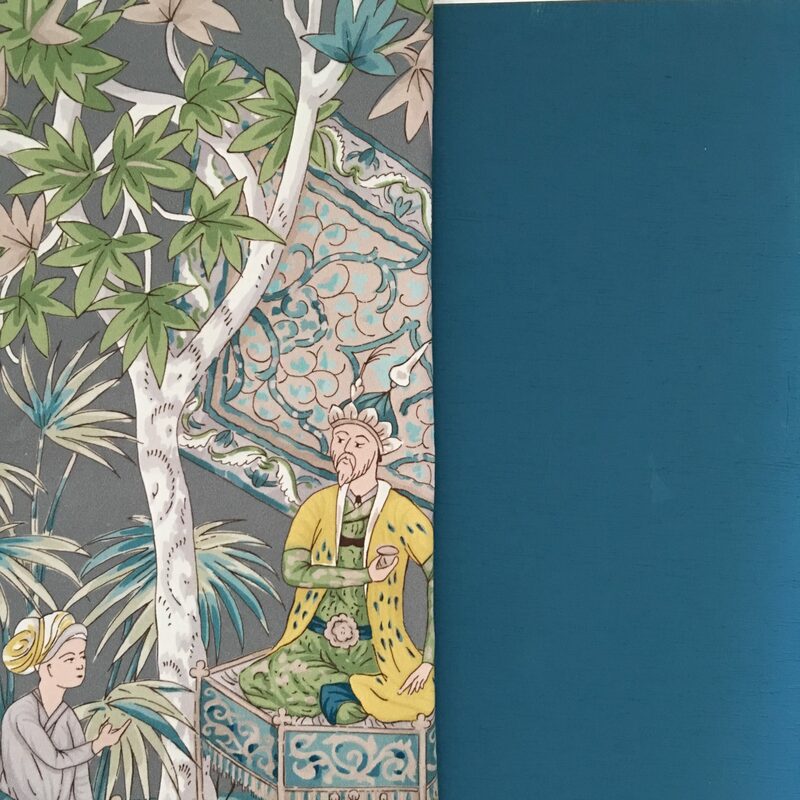 Plus, I absolutely love to add a little unexpected top note to any scheme, in this case a dash of Chinoiserie via the amazing ‘Lodi Garden’ print from Brunschwig & Fils which I had made up into a pencil pleated curtain to drape across the back wall. 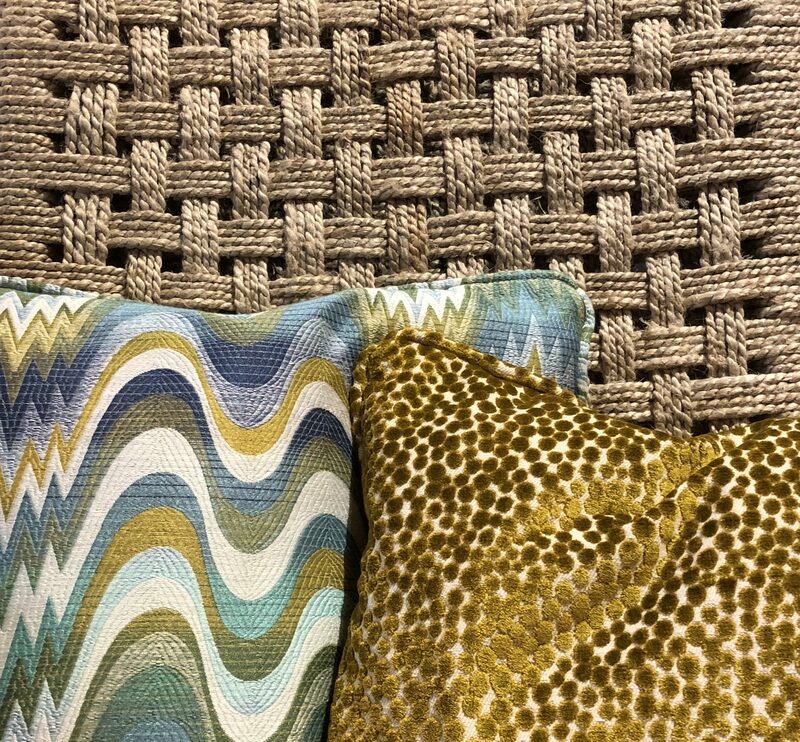 And then the mix of fabrics I chose for the cushions (‘Say Goodbye Flora’ from Dedar; ‘Xian’ from Brunschwig & Fils; ‘Acid Palm’ and ‘Polka Dot Plush‘ in a wonderful mustard colour, both from Kravet) was all about adding contrast and spice. Softening the space, and mixing all of these elements together to create something warm and inviting. 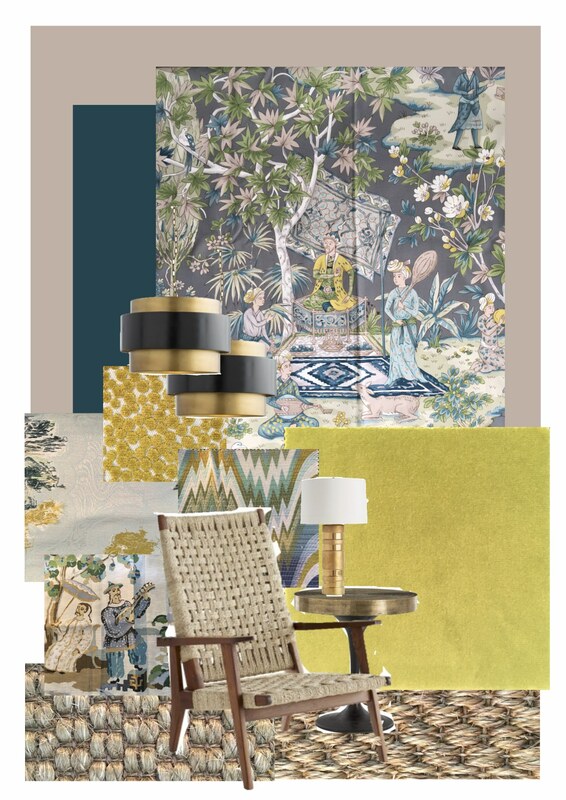 Moodboard of materials and colours: ‘Lodi Garden’ in grey and ‘Xian’ in Seafoam from Brunschwig et Fils; ‘Acid Palm’ in surf by Jonathan Adler for Kravet; ‘Polka Dot Plush’ in quince also by Kravet; ‘Say Goodbye Flora’ by Dedar, as is the Cedre coloured velvet. Paints: ‘Marine Blue’ and ‘Light Peach Blossom’ both from The Little Greene Paint company. Mock up for the main ‘Turner’ sofa set-up. The aim was for a sense of off-beat symmetry focused around this grand swoop of a sofa, with chandelier hung on either side like a pair of fabulous drop earrings. 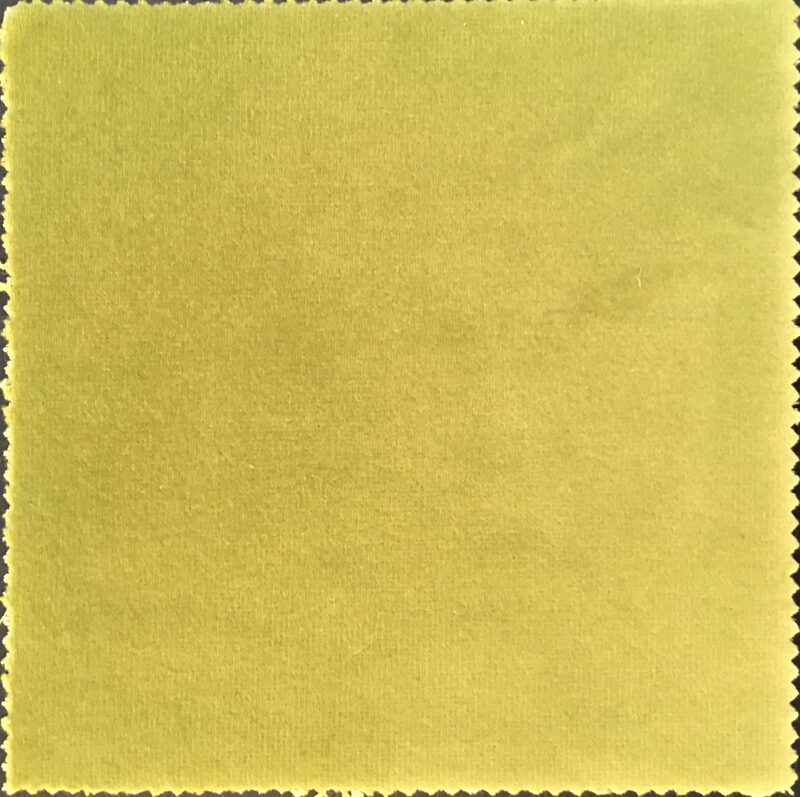 Used to upholster the sofa, the ‘Adamo & Eva’ 100% cotton velvet from Dedar in the crisp green 150 colour way called ‘Cedro’. (Martindale 50,000, 140cm wide). Jonathan Adler’s ‘Acid Palm’ fabric in surf, and the ‘Polka Dot Plush’ in quince, both from Kravet, made into cushions by Adrian Robins Design,; and shown on the the ‘Jericho’ chair with it’s hand-woven jute seat..
Can you talk us through the design process for the space and how consumers can translate this to their homes? I work in a way that I consider to be inspirational yet achievable for a consumer, just as I did when I was editing ELLE Decoration. I’ve deliberately picked pieces that I felt could be ‘Future Classics’, timeless furniture and lighting you could live with for a lifetime. And then I’ve accessorized them very simply with texture underfoot in the form of the fabulous ‘Volos’ carpet from Tufenkian Carpets, underpinned with sisal matting from Tim Page Carpets, and then laid a nice big dollop of pattern on top of it all via a clutch of deliberately differently-sized cushions. And then it’s all set up to create the sense of a liveable space that could easily be translated into a home: a central focal point, framed by lighting and faced by two additional ‘moments’ that are designed to create a sense of dialogue and flow across the room, physically linked by the rugs underfoot. 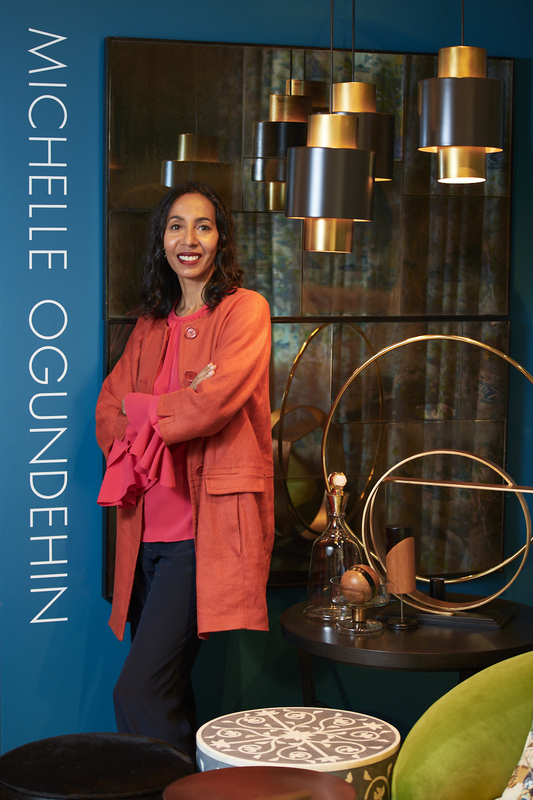 In short, I wanted to create a space within the showroom that customers could really relate to, come in, sit down in, and start to imagineer new interiors ideas for themselves. I think this is what needs to be at the heart of retail today, a sense of escapism made easy. Showing people what’s possible through design. But you need to hold people by the hand. It’s a fatal assumption to think everyone sees the world the way you do, and can automatically pair chairs and cushions, pots and platters. They can’t. But show them the way and I believe they will buy. 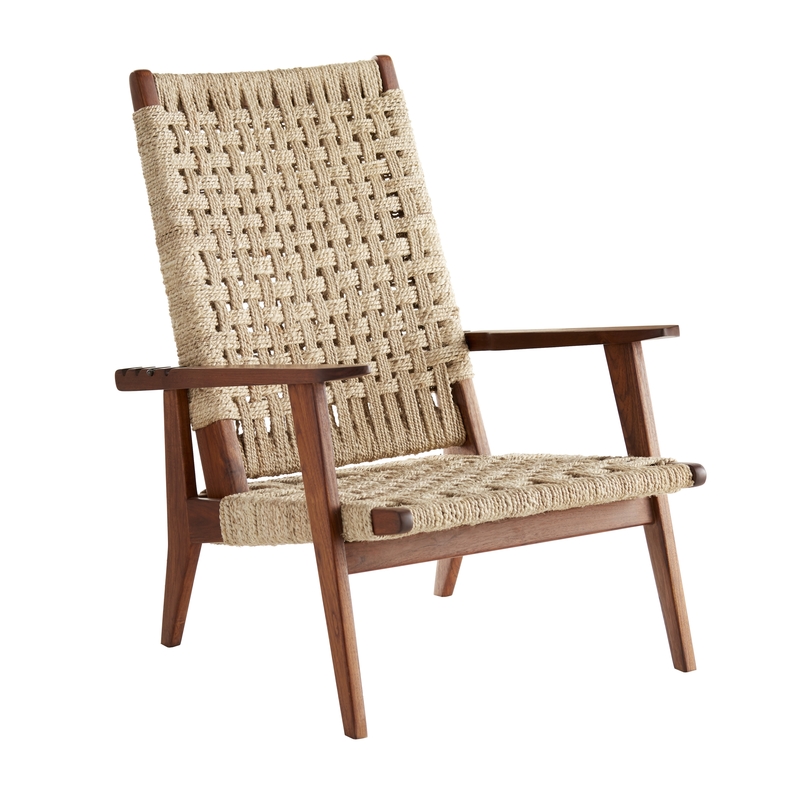 The ‘Jericho’ adjustable armchair in wood with hand-woven jute seats. 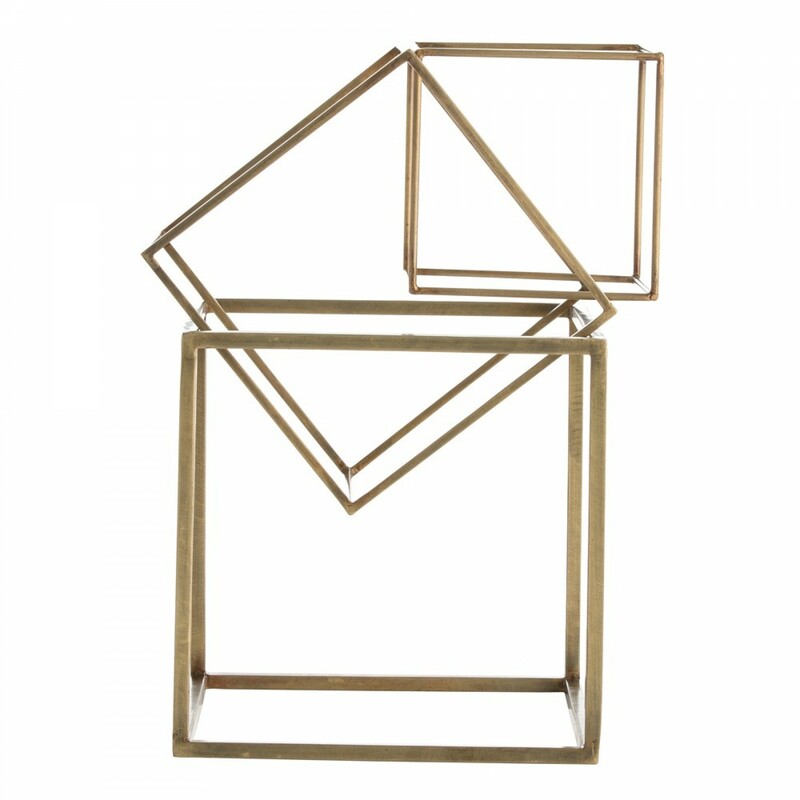 £3,754, Arteriors Home. The ‘Luxembourg’ mirror crafted from distressed mirror pieces. Can be hung vertically or horizontally. I used two of these, hung horizontally in my installation. (Approximately 113cm by 71cm) £1,234. 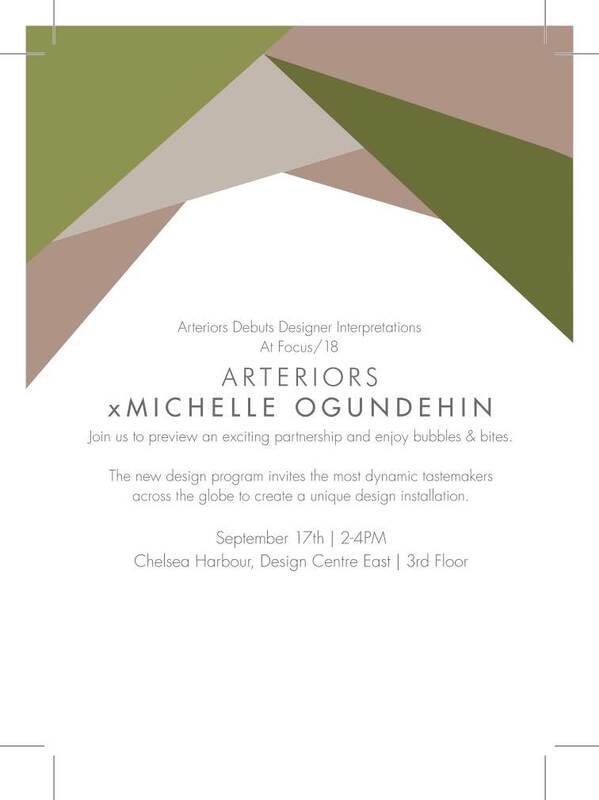 Arteriors Home. 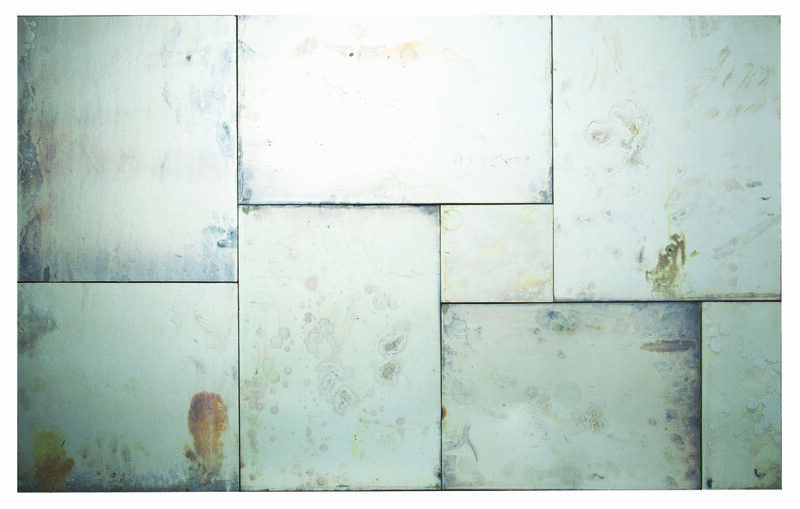 The ‘Luxembourg’ mirror crafted from distressed mirror pieces. Can be hung vertically or horizontally. (Approximately 113cm by 71cm) £1,234. Arteriors Home. 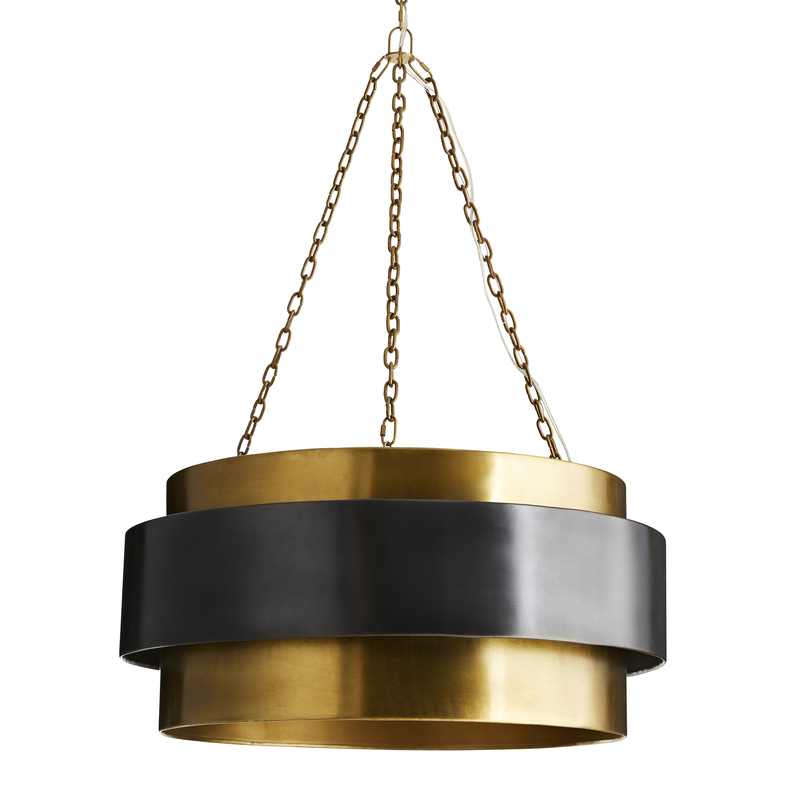 The ‘Jonas’ chandelier with antique brass cylinders and bronze outer bands. £1,743 Arteriors Home. The ‘Violetta’ table lamp. A modern classic. So simple yet so striking. 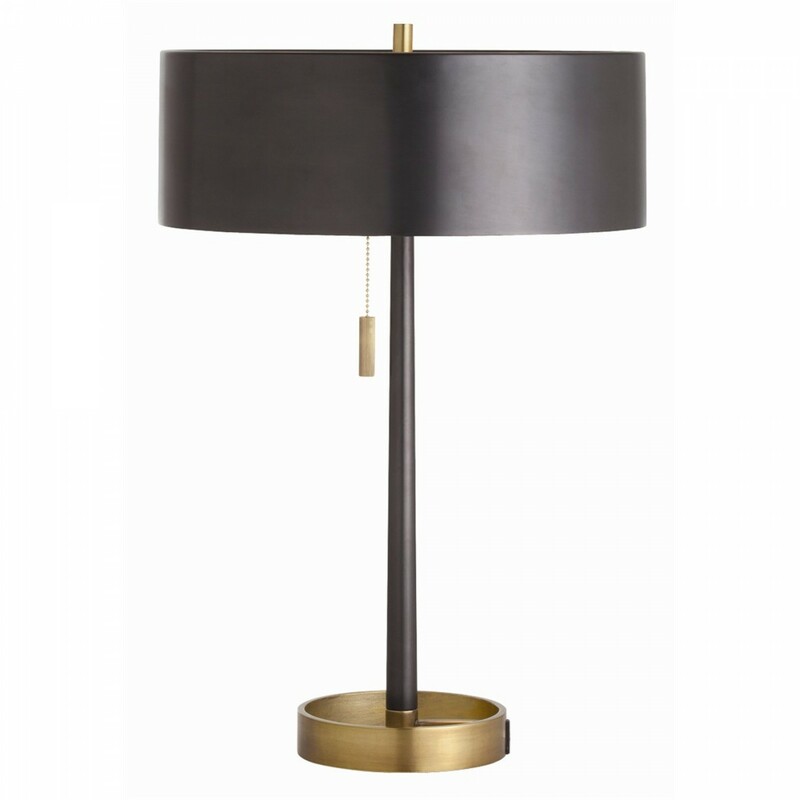 Also comes as a floor lamp.£885 Arteriors Home. The ‘Violetta’ table lamp. A modern classic. So simple yet so striking. Also comes as a floor lamp. 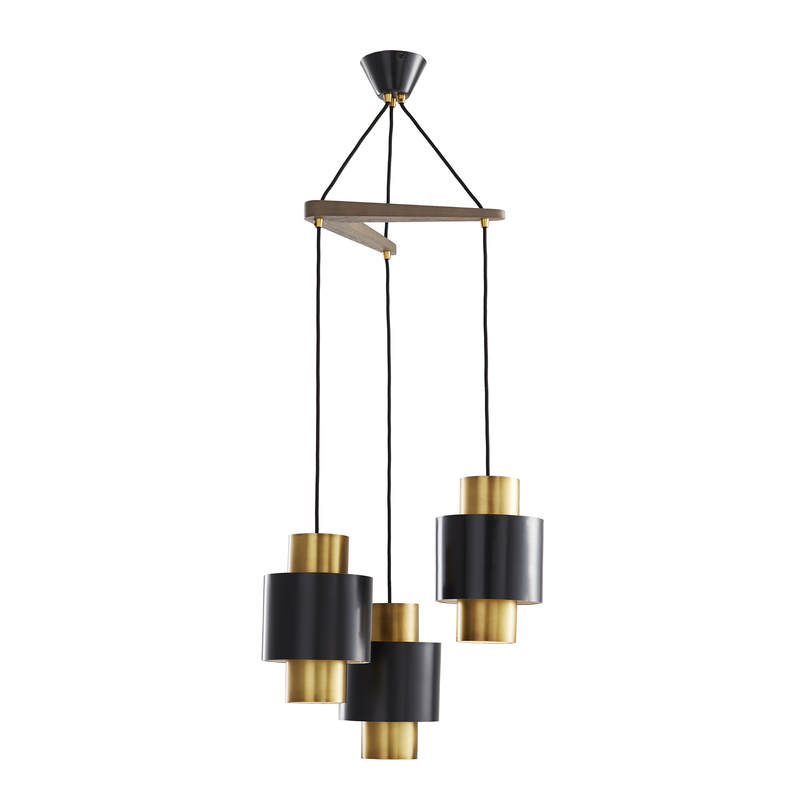 £885 Arteriors Home. 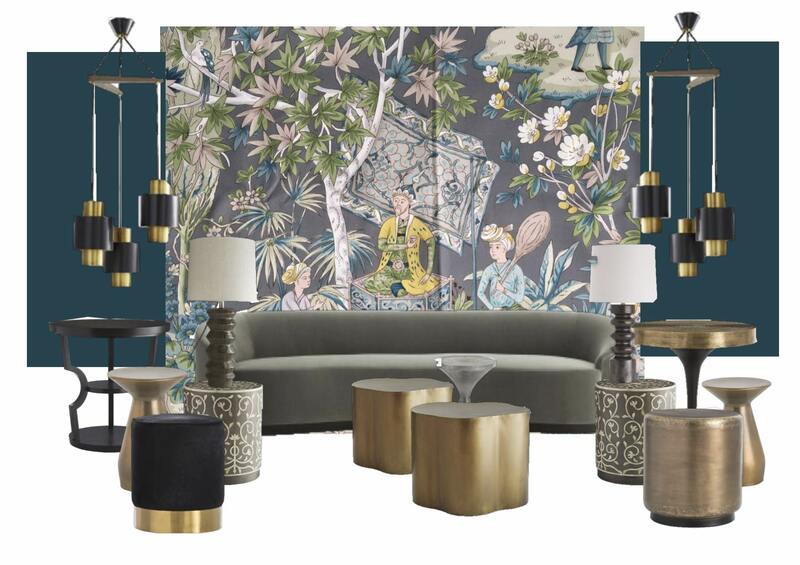 Although I’m pretty sure I’ve mentioned all my non Arteriors partners-in-design above in the copy and captions, I thought it would be handy to group them all together here, nice and clearly. 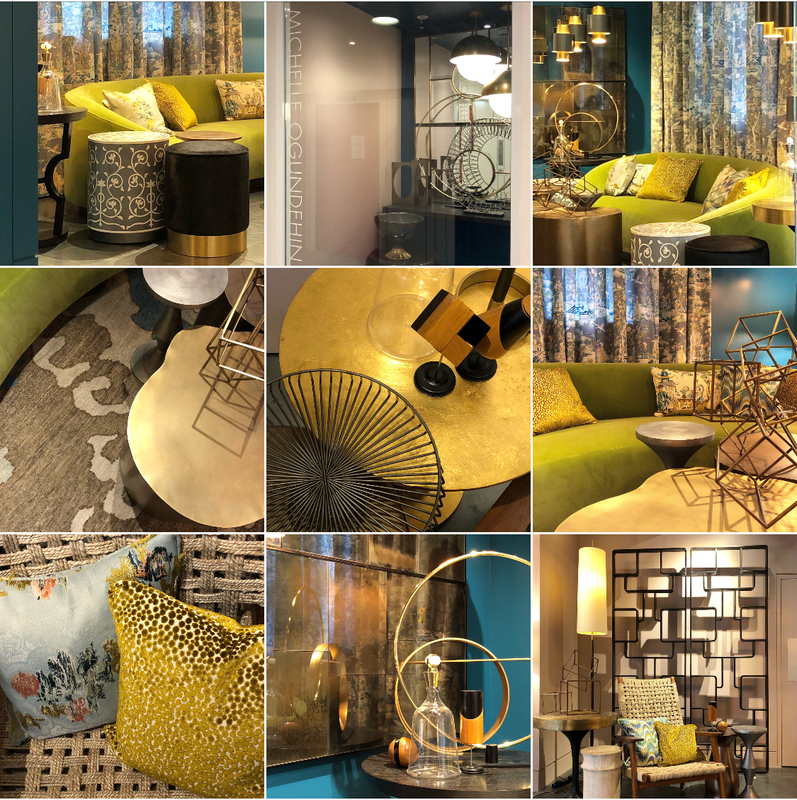 And to note that they’re all available via their showrooms at the Chelsea Harbour Design Centre, a veritable one-stop department store for design!